During the supreme madness of the Pokémon GO season this summer, it wasn’t uncommon to hear people talk about how the insanely popular game was boosting activity levels and making people walk miles more than they did before. That effect appears to have been significantly overstated, according to research published in the British Medical Journal. Now, to be clear, this research is real, although the journal, while it is a major one, tends to give itself over to frivolity during the holiday season. That one of the Harvard researchers is dressed as Pikachu while presenting their results is instructive. The study (noticed by Popular Science) surveyed 1,182 Americans, all of whom had an iPhone 6, and a little under half of whom were Pokémon GO players. The participants were found on Amazon’s Mechanical Turk, which at this point seems like something of a niche population — but then again, most of what we know about psychology was learned by testing psych undergrads, so we can give this particular sourcing a pass. At any rate, in the weeks leading up to the game’s release, there was no significant difference between steps taken — automatically recorded by the phone — by the two groups. The week the game came out, however, the Pokémon-playing group showed an average of 955 extra steps per day, while the control group remained near the baseline. These were, of course, the crazy early days of the app, when everyone was walking their feet off trying to catch ’em all. Additional analysis, by the way, showed no significant interaction effect with other variables — age, income, neighborhood walkability, etc. That could be from a lack of data, or it could be that the game just caused comparable increases across the board regardless of other factors. Although the association between Pokémon GO and change in number of steps was short lived in our study, some people might sustain increased physical activity through the game. 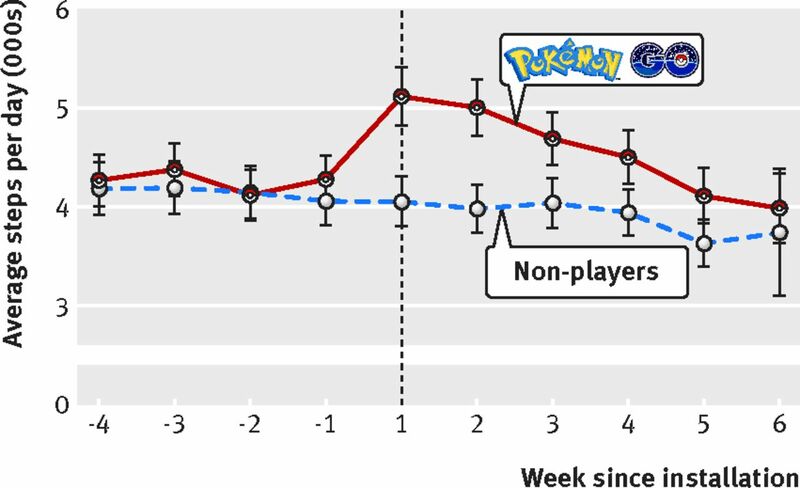 Also, the effect of Pokémon GO on physical activity might be different in children, who were not included in our study. Other potential benefits might exist, such as increased social connectedness and improved mood.